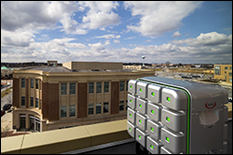 Redox Power Systems, an Mtech Technology Advancement Program (TAP) incubator company developing fuel cells and distributed power generation systems for commercial, industrial, residential, military and mobile applications, has won the 2015 Maryland Incubator Company of the Year Award for Best Environment/Energy Company. The award was presented to Bryan Blackburn and Tom Langdo of Redox, Eric Wachsman of the University of Maryland, and Craig Dye of Mtech at the Maryland Incubator Company of the Year Awards ceremony on June 4 at the American Visionary Art Museum in Baltimore, MD. Co-founded by Professor Eric Wachsman, director of the University of Maryland Energy Research Center (UMERC), Redox is commercializing Solid Oxide Fuel Cell (SOFC) technologies with high power density and lower operating temperatures, enabling the company to drastically reduce the cost, size, and weight of reliable on-site electrical generation systems. Among the technologies available to convert hydrocarbon-based fuels (e.g., natural gas) to electricity, SOFCs uniquely have an energy conversion efficiency of 45-65 percent, which is nearly twice the efficiency of conventional internal combustion engines. In combined heat and power applications, the energy conversion efficiency can approach 90 percent. The modular nature of Redox’s products allows the tailoring of systems to a broad range of power generation capacities and fuel options. The Maryland Incubator Company of the Year Awards publicly recognize achievements by current clients and graduates of all Maryland incubators and provides a forum for the nominees to increase their visibility in the business, technology, and investment communities. The Best Environment/Energy Company category recognizes companies that produce products or provide services that minimize damage to the environment. Redox is truly honored to be recognized as an Incubator Company of the Year, which is a result of the hard work and efforts of the Redox Team,” said Bryan Blackburn, Acting Chief Executive Officer, co-founder, and Chief Technology Officer of Redox. “We are proud to do business in Maryland and look forward to being a driver of significant job creation in the state. And we would like to thank Mtech and the A. James Clark School of Engineering at the University of Maryland for helping us as we grow. Redox has a long history with the Clark School’s Maryland Technology Enterprise Institute (Mtech). In 2012, the company was a winner in the University of Maryland $75K Business Plan Competition. That same year, Redox entered Mtech’s Venture Accelerator (VA) program, which speeds the advancement of promising early stage technology companies at UMD through intensive business guidance. Redox graduated from VA program after only one quarter. In 2014, the company received an Mtech Maryland Industrial Partnerships (MIPS) program grant to characterize the strength, performance, and reliability of enhancements Redox is making to its SOFCs. In late 2014, Redox entered the TAP incubator, which provides high-tech on-campus workspace and continued expert business guidance.